I’ve been thinking about why I’m writing this memoir. As the author of two novels, Woman’s Cry and Play Right (which I walked away from in its final stages because the memoir took me over), I’ve been kicked around by how different the process of memoir is, the journey. Yes, I consciously used the phrase “kicked around” because that’s how it’s felt, like an assault on many levels. With fiction, I just wrote. I’m an intuitive writer so I’ve never laid out my story, outlined it or the characters in any lengthy way before I start writing the story. Much of that I do in the editing process, when I’m reconciling tone and structure (I think of Freytag’s triangle of dramatic structure, Anne Lamott’s mnemonic device, & Chris Abani’s brilliant analogy that story structure is like the make-out of a hospital, getting the cadavers and laundry out without public witness are what determines how the hospital is built), making sure the the characters are developed and have their own voice, etc. Memoir is not like this at all. While I’ve repeated the “just write” process that’s worked for me in writing essays and fiction, the path to A Dim Capacity for Wings is reminiscent of a snake’s s-shaped gait. It’s like a river that courses around boulders, mountains, digging valleys, and cascading down cliffs to make it to its ultimate destination where it is swallowed up by the ocean. That is to say, in memoir, as in life, there’s no straight yellow brick road to the climax, crisis, denouement and conclusion. I’ve been writing this memoir for more than a decade. I realized this a few years ago when I started re-reading my writings that I’ve collected over the years — journals, print outs, musings scribbled on napkins and the borders of newspaper and magazine articles — which my O.C.D.-I-must-save-every-last-thing side has stashed in three large bins I’ve carried to every apartment and hovel I’ve lived in. While I’ve always seen my memoirs as a pentagonía, I never questioned why, I just trusted my gut. I started writing this memoir in earnest about four years ago. It started as musings about my life, my relationship with my mother, the experiences and heartbreaks I’ve had in my journey to becoming a woman and mother, the asinine decisions I made along the way, as well as the brilliant. I started documenting my resilience and shortly into the writing, I realized I was penning my first memoir. That’s when I started re-reading my writings. I saw that similar themes appeared throughout–abandonment, a search for belonging, loneliness, mom issues, etc.–and stopped reading. It was time to write. Over the last two years, I’ve just been writing. Writing a lot. 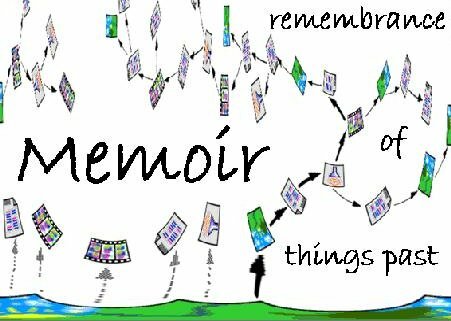 I was surprised to find that the memoir is coming out in stories, what I call flashbulb memories that are so vivid, I can remember the smells and expressions on peoples faces. These are moments that shifted me in many ways so I was never the same after experiencing them. During the process I learned that I can write this memoir because I wrote fiction prior to taking on this project. I can put the reader in the scenes so they smell the earthy sour-sweet of the plum tree in my backyard, the heavy cilantro, garlic and green pepper spice of the sofrito wafting from the windows, they can feel the terror and pain of that little girl that I was who fled up that plum tree where I started telling myself stories to cope with my reality. I can do this because I learned the art of constructing scenes in writing fiction. The thing is, sitting in some of the scenes of my life, reliving them can be (and has been) devastating but I have to feel that to write it, and I have. Writing fiction hasn’t done that to me in such a paralyzing way because even if the stories are influenced by real life events, the fiction tag gives me a distance, a detachment that makes the writing easier. Earlier this year, after writing and reading and reading and writing and reading (at a later date I’ll post a blog on the obsessive reading and research I’ve done in preparation for this memoir) and writing some more, I reached a stale-mate. I had tons of material, dozens of stories, but I couldn’t find the thread that brought all of it together like a neatly weaved Kente cloth. Truth is the memoir was all over the place, spanned my entire life and confronted far too many issues and tragedies. The memoir had no focus. The reality rattled me. I’d been writing for so long. How could this be possible? I didn’t know what to do. I wasn’t even writing at that point. I was reading tons still but my well had run dry. I was stuck. That statement shook something loose. He was right, of course. What/Who was I trying to protect? There was no relationship to break. My mother hadn’t (and still hasn’t) spoken to me since early December. I started writing again that very night. I wrote furiously for the next few days. Then it dawned on me–my first memoir is about my relationship with my mom, and what happened that I left at the tender age of 13 and never moved back. Thank you V for sharing this. You continue to keep reminding me, that I too must cut loose from my haunting childhood, without worrying of damaging a relationship I do not share, & never have with my mother. God bless you on your journey V. I cannot wait to read your memoir! You make me feel so much better about writing my own story. There are struggles, it’s part of who we are. And that’s ok.
Write it, mama. Write it!